I wrote recently about the crazy weird things that have been happening lately, including jaundice, hemolysis, chest pain, a weird rash that made my eye shut because of the swelling, swollen lymph nodes, and mild leukocytosis. I saw the rheumatologist on Monday, but first saw the resident (or fellow, I'm unsure which she was). She took my entire medical history, which is always difficult to go through, and remember every tiny, and major thing that has happened. When the rheumatologist came in, he was already pretty convinced that I had Lupus. I have a strong family history of Auto-Immune diseases, I have about 8 out of the 11 qualifying symptoms needed to make a diagnosis, and for once, this diagnosis was pretty straight forward. Unfortunately, because I had to have my adrenal glands removed in order to treat Cushing's Disease, the usual initial treatment of predisone to stop the flare up was not a good treatment for me. Instead, I will take plaquenil, or hydroxycloroquine, which may take up to 3 months to work. A new diagnosis is always hard to get, even if it means I finally have an answer to all these weird symptoms. It always means more appointments, more medication, and more symptoms, and most of the time, a lower quality of life. 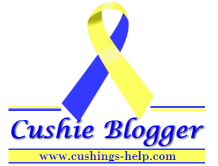 It has been 10 years since I knew I had Cushing's, and about 14 years since I started having symptoms. I don't even remember what it was like to feel well, and maybe this is as good as it gets. When big chunks of life are hard to handle at one time, stop.... and just take it day by day or hour by hour if you have to. The trials that you face today will be a mere memory 6 months from now. I still struggle with health problem after health problem (I'm not comparing my struggle to yours by any means). Its hard to feel "broken" most of the time and sick and tired of being sick and tired...especially when no one else seems to understand.... but the darkness can't last forever! Keep having faith that there is an end to this tunnel and press forward one day at a time.